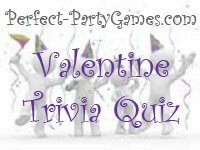 Summary: Valentine Trivia Quiz is a game to test your knowledge of facts and myths surrounding Valentine's Day. The only set-up involved is the printing of the quiz. Set a time limit for answering the questions. Have each player answer as many questions as they can in the time allotted. The player with the most correct answers wins. About 1 billion Valentine's Day cards are exchanged each year. That's the largest seasonal card-sending occasion of the year, next to Christmas. February 14, 270 A.D.: Roman Emperor Claudius II, dubbed "Claudius the Cruel," beheaded a priest named Valentine for performing marriage ceremonies. Claudius II had outlawed marriages when Roman men began refusing to go to war in order to stay with their wives. Hallmark has over 1330 different cards specifically for Valentine's Day. In Wales, wooden love spoons were carved and given as gifts on February 14th. Hearts, keys and keyholes were favorite decorations on the spoons. The decoration meant, "You unlock my heart!" It wasn't until 1537 that St. Valentine's Day was declared an official holiday by England's King Henry VIII. On February 14, 1779, Captain James Cook, the great English explorer and navigator, was murdered by natives of Hawaii during his third visit to the Pacific island group. One single perfect red rose framed with baby's breath is referred to by some florists as a "signature rose," and is the preferred choice for many for giving on Valentine's Day. Sir Alexander Fleming was a young bacteriologist when an accidental discovery led to one of the great developments of modern medicine. Having left a plate of staphylococcus bacteria uncovered, Fleming noticed that a mold that had fallen on the culture had killed many of the bacteria. He identified the mold as penicillium notatum, similar to the kind found on bread. On February 14, 1929, Fleming introduced his mold by-product called penicillin to cure bacterial infections. Some people used to believe that if a woman saw a robin flying overhead on Valentine's Day; it meant she would marry a sailor. If she saw a sparrow, she would marry a poor man and be very happy. If she saw a goldfinch, she would marry a millionaire. Teachers will receive the most Valentine's Day cards, followed by children, mothers, wives, and then, sweethearts. Children ages 6 to 10 exchange more than 650 million Valentine's cards with teachers, classmates, and family members. The "I Love You" computer virus was detected in Hong Kong on May 1, 2000. In four days the virus had mutated into three different generations. Figures by Trend Micro Inc. showed that "I Love You" had infected 3.1 million computers worldwide. In the 17th century a hopeful maiden ate a hard-boiled egg and pinned five bay leaves to her pillow before going to sleep on Valentine's eve. It was believed this would make her dream of her future husband. The ancient Romans celebrated the Feast of Lupercalia in honor of Juno, the queen of the Roman gods and goddesses on February 14. Juno was also the goddess of women and marriage. The first American publisher of valentines was printer and artist Esther Howland. During the 1870s, her elaborate lace cards were purchased by the wealthy, as they cost a minimum of 5 dollars - some sold for as much as 35 dollars. Mass production eventually brought prices down, and the affordable "penny valentine" became popular with the lower classes. The first photograph of a U.S. President was taken on February 14, 1849 by Matthew Brady in New York City. President James Polk was the subject of the famous picture. The first televised tour of the White House aired on February 14 in 1962. First Lady Jackie Kennedy hosted the tour. The heart is the most common symbol of romantic love. Ancient cultures believed the human soul lived in the heart. Others thought it to be the source of emotion and intelligence. Some believed the heart embodied a man's truth, strength and nobility. The heart may be associated with love because the ancient Greeks believed it was the target of Eros, known as Cupid to the Romans. Anyone shot in the heart by one of Cupid's arrows would fall hopelessly in love. Because the heart is so closely linked to love, its red color is thought to be the most romantic. The red rose was the favorite flower of Venus, the Roman goddess of love. Red stands for strong feeling, which is why a red rose is a flower of love. Chocolate manufacturers currently use 40% of the world's almonds and 20% of the world's peanuts. I hope you enjoyed these valentine trivia quiz facts and myths as much as I did. The research portion of my work on this valentine trivia quiz page was most enjoyable. My daughter and I just laughed over several of the points we found. Do you know more Valentine Trivia Quiz facts that you would like to share? We would love to add them to this page.